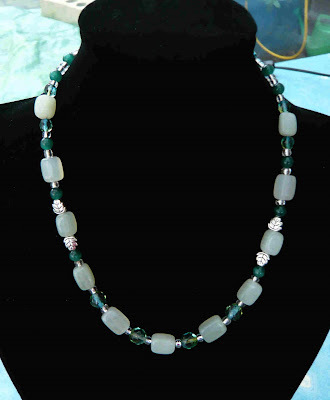 Green aveturine nuggets with green, clear and silver beads. I like how you put the silver leaf beads in - very unexpected! I love reading comments, please leave one. A few years ago, I had my mum's old pearl necklace repaired and restrung by a craft shop. They made a nice job of it and when I looked at it carefully I thought "I think I could learn how to do this".